Enjoy your holiday Keshka. That looks yum! Love, love the layout. I've never tried challah. Sounds delicious. Also sounds dangerous for my arse. :) Have a good holiday! 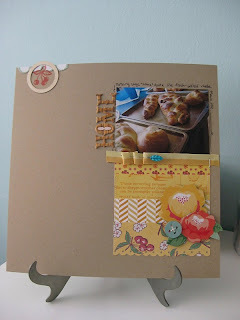 yummy layout and bread, I am so not a bread from scratch maker so I totally admire those who can. That bread sounds wonderful and I love the colors you used. Very pretty page and the bread sounds amazing! i love this layout!!! the challah looks amazing! Love the little bits of folded ribbon, great layout! !